← What A Year for Home Loan Rates! CoreLogic has released new analysis showing nearly 273,000 U.S. homes returned to positive equity in the third quarter of 2014, bringing the total number of mortgaged residential properties with equity to approximately 44.6 million, or 90 percent of all mortgaged properties. Nationwide, borrower equity increased year over year by approximately $800 billion in the third quarter of 2014. 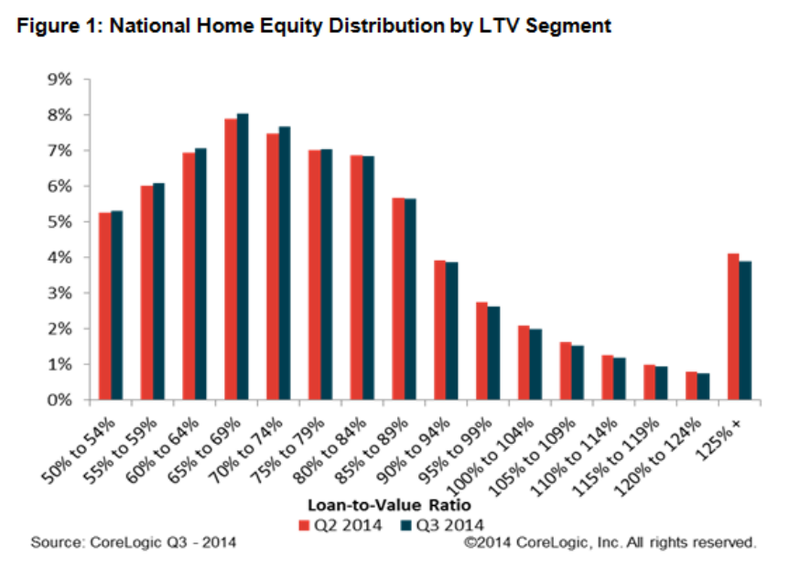 The CoreLogic analysis indicates that approximately 5.1 million homes, or 10.3 percent of all residential properties with a mortgage, were still in negative equity as of Q3 2014 compared to 5.4 million homes, or 10.9 percent, for Q2 2014. This compares to a negative equity share of 13.3 percent, or 6.5 million homes, in Q3 2013, representing a year-over-year decrease in the number of underwater homes by almost 1.5 million (1,433,296), or three percent. 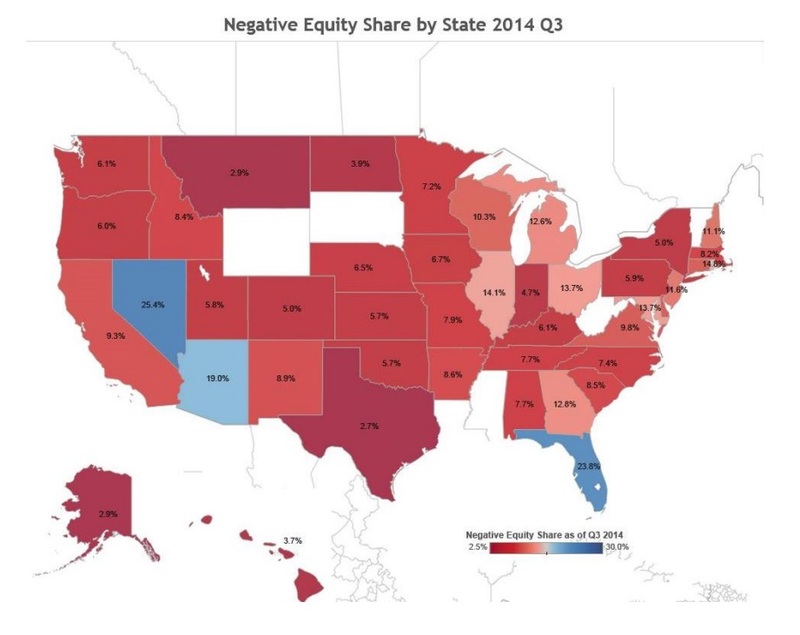 For the homes in negative equity status, the national aggregate value of negative equity was $338 billion at the end of Q3 2014, down $10.2 billion from approximately $348.2 billion in the second quarter 2014. On a year-over-year basis, the value of negative equity declined from $403.2 billion in Q3 2013, representing a decrease of 16.2 percent in 12 months. Of the 44.6 million residential properties with positive equity, approximately 9.4 million, or 19 percent, have less than 20-percent equity (referred to as “under-equitied”) and 1.3 million of those have less than 5-percent equity (referred to as near-negative equity). 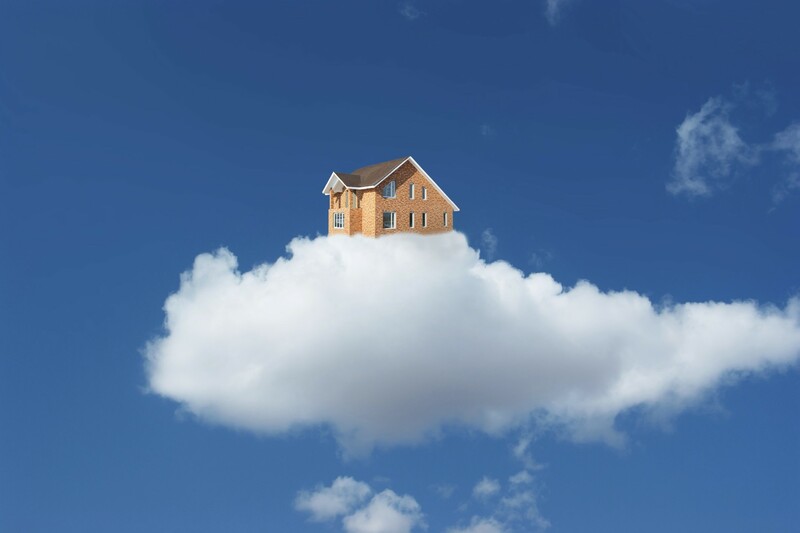 Borrowers who are “under-equitied” may have a more difficult time refinancing their existing homes or obtaining new financing to sell and buy another home due to underwriting constraints. Borrowers with near-negative equity are considered at risk of moving into negative equity if home prices fall. In contrast, if home prices rose by as little as five percent, an additional one million homeowners now in negative equity would regain equity. ►Nevada had the highest percentage of mortgaged properties in negative equity at 25.4 percent, followed by Florida (23.8 percent), Arizona (19 percent), Rhode Island (14.8 percent) and Illinois (14.1 percent). These top five states together account for 33.1 percent of negative equity in the United States. ►Texas had the highest percentage of mortgaged residential properties in an equity position at 97.4 percent, followed Alaska (97.1 percent), Montana (97.1 percent), Hawaii (96.4 percent) and North Dakota (96.1 percent). ►Of the 25 largest Core Based Statistical Areas (CBSAs) based on population, Tampa-St. Petersburg-Clearwater, Fla., had the highest percentage of mortgaged properties in negative equity at 25.5 percent, followed by Phoenix-Mesa-Scottsdale, Ariz. (19.3 percent), Chicago-Naperville-Arlington Heights, Ill. (16.3 percent), Riverside-San Bernardino-Ontario, Calif. (15 percent) and Atlanta-Sandy Springs-Roswell, Ga. (14 percent). ►Of the same largest 25 CBSAs, Houston-The Woodlands-Sugar Land, Texas had the highest percentage of mortgaged properties in an equity position at 97.5 percent; followed by Dallas-Plano-Irving, Texas (97 percent); Anaheim-Santa Ana-Irvine, Calif. (96.6 percent); Portland-Vancouver-Hillsboro, Ore. (96.4 percent) and Denver-Aurora-Lakewood, Col. (95.9 percent). ►Of the total $338 billion in negative equity, first liens without home equity loans accounted for $178 billion, or 53 percent, aggregate negative equity, while first liens with home equity loans accounted for $160 billion, or 47 percent. ►Approximately three million underwater borrowers hold first liens without home equity loans. The average mortgage balance for this group of borrowers is $230,000. The average underwater amount is $58,000. ►Approximately 2.1 million underwater borrowers hold both first and second liens. The average mortgage balance for this group of borrowers is $299,000.The average underwater amount is $78,000. ►The bulk of home equity for mortgaged properties is concentrated at the high end of the housing market. For example, 94 percent of homes valued at greater than $200,000 have equity compared with 85 percent of homes valued at less than $200,000. This entry was posted in Q3 2014 Home Equity Improves and tagged Buying a new home, Equity, finances, financial future, financial planning, home loan, investments, lenders, money, mortgage, saving money. Bookmark the permalink.